Cowhide rugs are normally black, brown and white naturally because these are the color of cows. So in our warehouse, we have more of the tricolor rugs, black and white and brown and white cowhide rugs simply because there are more of these colors in the tanneries. Maybe you’re now thinking that you are tired of the ‘normal’ and you are looking for other alternative rugs. But before you check out flokatis or fabric rugs, check out if you’d like the dyed cowhide rugs. Dyed cowhide rugs are cowhides that have been dyed with different colors – obviously. You’ll be surprised at different colors available – purple, yellow, pink, red, fuschia, green, black and others! Just one of these dyed cowhide rugs can change the feel of your home. Try it in your office too and who knows, you might attract more clients and friends as well! Want something different? Lay a pink dyed cowhide rug in your living room. 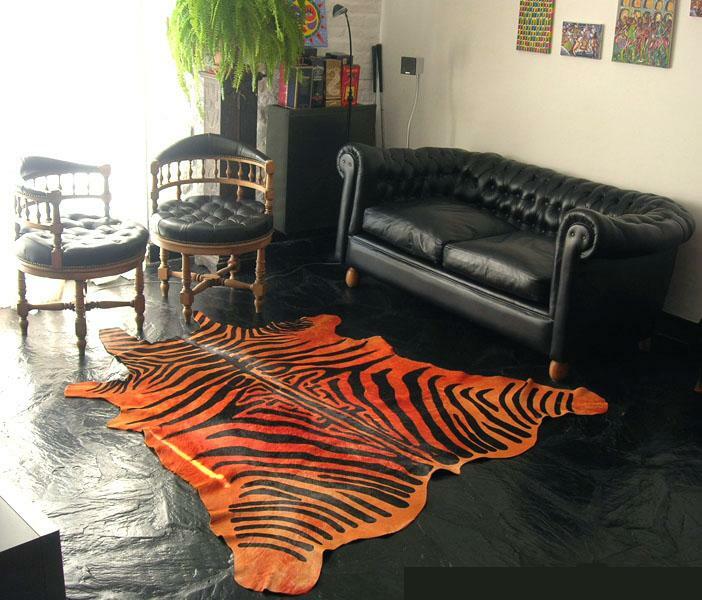 This orange dyed zebra cowhide rug surely gave a kick to the dark interior. Black is beautiful, yes, especially when it is a cowhide rug! 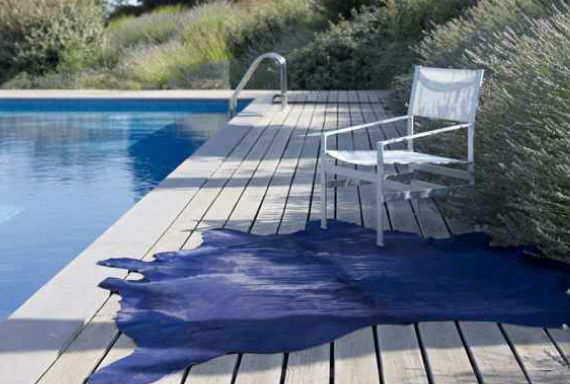 This blue dyed cowhide rug matches the color of the pool, so perfect! So who says cowhide rugs are boring? This entry was posted on July 15, 2013 by ecowhides and tagged Black-and-white, Carpet, colored cowhide rugs, cowhide, cowhide rug, cowhides, dyed cow hide, dyed cowhide rug, dyed cowhide rugs, dyed rugs, Floors, Home and Garden, interior design cowhide, rug, Shopping, Tanning.